Western Australia leads the way. The resources sector, which comprises both Materials and Energy stocks, continued to contribute a large number of IPOs during 2018. Overall there were 35 new resource listings for the year raising a total of $4.08 billion. Viva Energy Group led the way raising $2.65 billion. However, outside of this only six companies raised over $10 million, with there being a significant number of small listings overall. Share price performance post-listing was underwhelming. On average resource IPOs posted a first day gain of 2% but the average result by the end of the year was a loss of 27%. On a state-by-state basis, Western Australia led the way with 27 new resource listings across the year raising $394.95 million. Western Australian listings had the strongest day one gains of any state averaging 12% but suffered an average year end loss of 26%. The other traditional mining state, Queensland, only had one listing in 2018, Mako Gold Limited, which raised $6 million. Victoria recorded two listings this year compared to five in 2017. New South Wales had a total of four IPOs raising $998 million in total with an average year end loss of 27% over listing price. For the first three quarters of 2018, Resources subscription rates were solid with an average of 92% of the amounts sought being successfully raised. The December quarter however saw subscription rates fall dramatically to just 68% on average which coincided with overall market conditions in the final quarter. This activity was also against the backdrop of the December quarter being the only quarter to record a significant average first day loss of 8%. It was the March quarter that saw the worst year end share price performance against listing price with an average loss of 50%. These companies experienced the longest period of the downturned market given that they listed in the first quarter of the year. 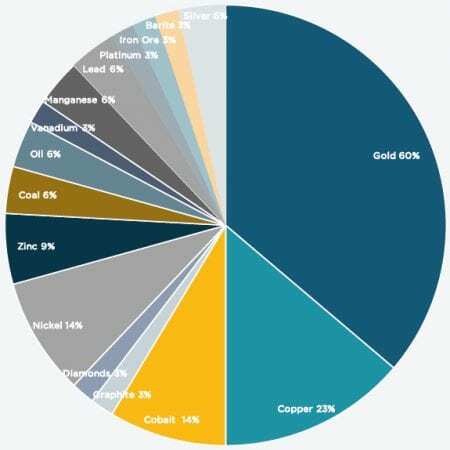 Resource IPOs were heavily weighted towards gold with 21 of the 35 listings having significant gold projects (including polymetallic explorers seeking multiple commodities). Copper projects appeared in 23% of resource IPOs, and both Nickel and Cobalt were well-represented with five listings each. It is worth noting that there were no new lithium IPOs in the current year perhaps correlating with price retractions from historical highs and uncertainty over the extent of supply side issues. There are seven resource listings in the pipeline so far for 2019, compared with nine at this time last year, which is a significant proportion of the overall pipeline at the date of this report. With the recent rise in gold price to A$1,800+ per ounce, we see that the gold sector is likely to continue to dominate the IPO space. This article was originally published in the 2019 IPO Watch Report. For Western Australian companies preparing to take the plunge and launch an initial public offering (IPO), more and more are turning to the local expertise of the HLB Mann Judd team in Perth.